The following is a spoiler review of Guardians of the Galaxy, a James Gunn film. Today I saw a movie that featured the characters that reignited a fire within me, reignited my passion for comic books – Guardians of the Galaxy. I’ve been really excited for this film for a long time, and I even feel like I’ve been ahead of the massive hype-train for a long time. In the following review, I will briefly discuss the credits-scene, I will shed some light on what I liked, disliked and what I would’ve liked to have seen more of in this film. Guardians of the Galaxy might become one of my favorite films of all-time sooner, rather than later. As is to be expected the plot deviates somewhat from the overall origin story of the comic book-Guardians, but their origin is still done so in a way that it feels right within the boundaries of the plot set forth by James Gunn & Nicole Perlman. Of course, with this being a whole new world for the Marvel Cinematic Universe, some explanations are needed, and are sometimes blurted out inelegantly in dialogue. 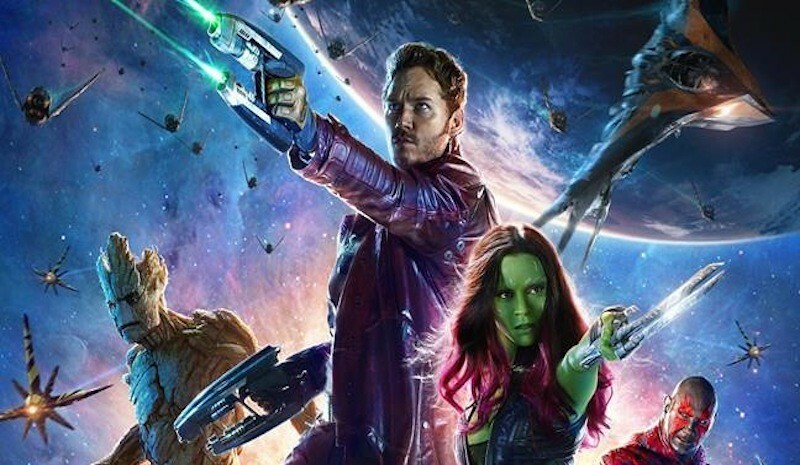 For better or worse, the Guardians of the Galaxy is a comedic B-list Avengers-like team. However, what really works marvelously is how emotional this family action film can be. One might be surprised to learn that the film opens with tears on Earth, as Peter Quill (played by Chris Pratt) sees his own mother pass away. This sets the story going in a great emotional way. We go from the late 1980s to present day. Quill is brought up by the Ravagers, led by Yondu (played by Michael Rooker), and kind of goes against them at the very beginning. The way the plot elegantly alters the setting and the story step by step is remarkable, and the tone quickly feels similar to Back to the Future or Ghostbusters. Gunn manages to keep control of the plot, and manages to introduce the main characters in a way that makes them likeable and interesting. This movie makes you care about a talking tree and a raccoon in need of anger management. I liken the protagonist, Peter Quill, not to Han Solo, but to the character of Marty McFly or Dr Peter Venkman. He works as a fun lead, but still with the needed gravitas to pull off Star-Lord. The Han Solo character is ever present in the plot as well, taking the form of Rocket Raccoon, though. Some like him British, but I do feel that Bradley Cooper pulled it off as Rocket. Groot, is amazing and takes the role as the film’s Chewbacca. And when he says more than the classic 3 words, it really works. Groot might be the heart of the film. As for Drax and Gamora? Well, their characters can’t really be likened to that of Hulk and Leia, but are actually rather raw and sweet in their own right. Drax is completely loveable, in his journey for Conan-like vengeance – and Gamora functions as one of the best female Marvel characters. I love pretty much everything about this movie, seeing as it manages to give us these unique characters, how it manages to keep the story within the timeline of the MCU (Thanos, the Orb – Hint Hint), while still feeling somewhat isolated from the universe at the same time. This film has created a fully formed cosmic Marvel universe. There are a number of ways this film can be continued in a sequel (which was confirmed at the San Diego Comic Con Marvel Panel), but it would have to stick with the theme of family – the family you are thrown into, as well as the one you choose. Credit-Scenes Spoiler: At the end of the credits, we see the Collector with his destroyed collection, Cosmo the Dog licks his face – and to comment on this fact we have… Howard the Duck (who you can spot earlier in the film behind the Collector). A fun joke for Marvel fanboys. Overall Score: 9.5 out of 10. No raccoons or tree-things were harmed while reviewing this film.